A car crashed into the barriers outside the UK Parliament injuring several pedestrians. Police have arrested one person in connection with the incident. Video from the scene showed smoke coming out from the bonnet of a vehilce and armed police standing guard. London Ambulance Service and London Fire Brigade were on the scene. 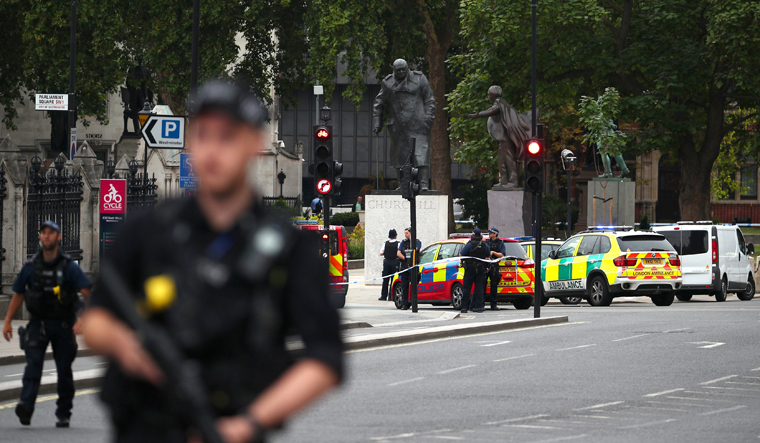 Streets around Parliament Square, Millbank and Victoria Tower Gardens have been cordoned off as dozens of armed police swooped on the scene. Officers could be seen surrounding the car before leading a man away in handcuffs. A number of ambulances were at the scene. It is understood Scotland Yard’s counter-terrorism command is part of the investigation and is monitoring the situation. It is yet to determine whether this was a terrorist incident or not, and to then make that finding public. A Downing Street source said it was too soon “to give the incident any firm description”. Scotland Yard said: “At 0737 hours today, a car was in collision with barriers outside the Houses of Parliament. The male driver of the car was detained by officers at the scene. A number of pedestrians have been injured. Officers remain at the scene.